Price This event is free of charge. But we have one rule: If you RSVP “yes” on meetup, you have to come. Welcome to an evening focusing on eGovernment! We will look into the aspects of more efficient communication between government and citizens as well as between companies and authorities. With the help of technology and better UI/UX there are endless opportunities to design and implement new solutions. It’s really about how to run a country more efficiently. If you are interested in open data, civic hacking, app development, social development, policy or related legal aspects, you have to come! Big thanks to Synch Law and eGovLabs for co-hosting this event. There will be lighter food, drinks and great mingling. Stockholm Mini Maker Faire is the festival where technology, play, science, art and experimentation meet. Here children and grown ups can try, discover, show, taste, get inspired and impressed by fantastic maker projects. The Festival is open to all and is included in the entrance to Tekniska museet. Learn how to solder your own blinking robot, build cool stuff from old electronic waste with the director of the children programme Andreas Hammar, meet all sorts of robots, watch demonstrations of the potato gun, try 3D-printers and build electronics experiments with LittleBits! 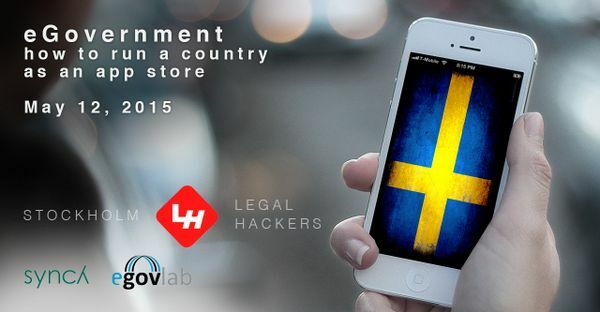 EAT MEET WORK PLAY is a hackathon to harness the exciting cultural diversity and open data in Sweden today. EAT MEET WORK PLAY is all about action – focusing on four distinct areas of life that directly affect us all. Why EAT MEET WORK PLAY? These are core parts of our lives, of our society, of what it means to be alive. Each team will take one of the themes and come up with new ways to use open data to create a positive impact on society and people’s lives. Official site Projekt:Öppna data 2015/Visualisering/Evenemang (in Swedish). As a finale of the four week long Wikidata Visualization Challenge the top teams will present their visualizations. A light lunch will be served and there will be time to mingle. Projekt:Öppna data 2015/Visualisering/Evenemang (in Swedish). On Friday the 20th of February VINNOVA will be hosting an un-formal meeting to discuss and plan Nordic Open Data Week 2015. The idea is to have a Nordic Open Data Week from the 29th of May to the 7th of June, and that the week will be filled with many different activities in the Nordic countries. After the event you can join the Open Data Day Afterwork event. All the Nordic countires are involved. The purpose of the week is to create manifestations of what open data is, and to show what value they have. It can be ’makers’ that build gadgets that are connected to some data, artists that create installations, data journalists and people doing information graphics, musicians that create sounds based on real time information, cities that visualise environmental data in the public space, etc. Other questions that you want on the agenda whould be communicated to the host ahead of time. A very basic webcast is being planned ((cell phone + bambuser).